My interest in She’areikha started a while back, when I was reviewing the new and absolutely beautiful Israeli Karaite erev Shabbat siddur. I noticed the inclusion of many, many famous (and some not-so famous) poems. In every case, I saw that the poem was attributed to some poet or another – that is, in every case except the very first poem in the siddur: She’areikha. At some point, I reached out to a contact in the Israeli Karaite community and asked why they did not attribute the poem to Shelomo ibn Gabirol, the undisputed author of She’areikha. He responded that the poem was markedly different from ibn Gabirol’s. He asked me to check it out for myself. Here is the version that appears at the NLI web-site and the one that appears in the Karaite siddur. (1)When I knock on Your gates, O Yah, open them; and to the poor person that asks before You – forgive. (2) May my prayer and my supplication reach You, in place of a sheep and an ‘issaron-measure and a grain-offering. (3) Accept the light of my eyes, and guard my heart; and if I err before You, O Yah, forgive [me]. (4) I lift up my heart and eyes to You; give ear, and keep [Your] eye open. (1) When I knock on Your gates, O Yah, open them; and if I am overwhelmed like a petitioner, send forth Your hand [to help me]. (2) May my prayer reach You, in my supplication, in place of a sheep and an ‘issaron-measure for a grain-offering. (3) Accept the light of my eyes, and guard my heart; give ear, and keep [Your] eye open. (4) I lift up my eyes and heart to You; and if I err before You – forgive [me]. As you can see, there are indeed differences – quite a few. 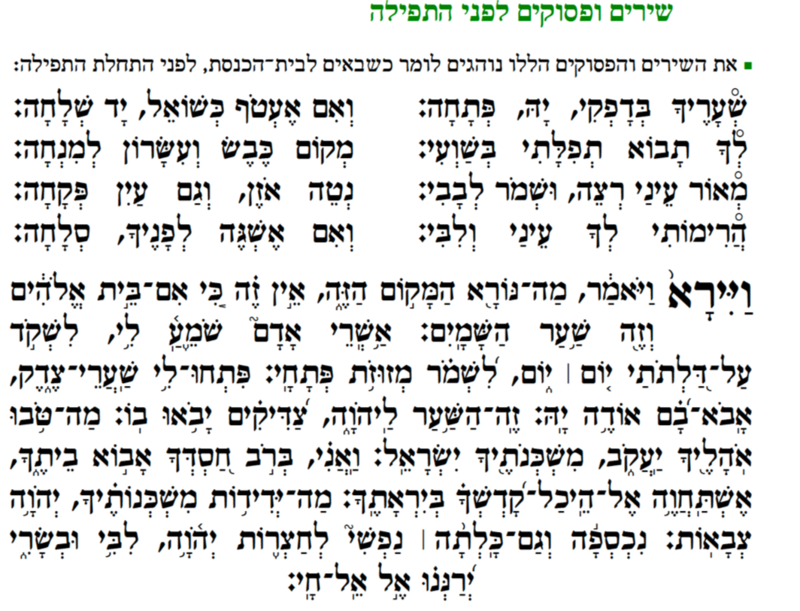 And to be fair to the Karaite in Israel, after these four lines, the Karaite rendition, as noted below, contains numerous additional pesukim (not pictured above) that are completely absent from any Rabbanite rendition I have found. But my initial impression was that the four line Karaite transmission – which appears in historical prayerbooks as well – is clearly based on ibn Gabirol’s original. What I only learned much later, though, is that we don’t know which of these – the Karaite or the NLI version -, if any, is the “original”. My predisposition is simple: if a poem of Rabbanite origin has been transmitted through both the Karaite communities and the Rabbanite communities, I would tend to resolve discrepancies in the poem in favor of the Rabbanite transmission. But here, the application of that principle would cause significant problems. As you can see from the image below (and the translation above), the last three words of the first line in the NLI version are the same as the last three words as the third line. That’s strange. All else being equal, why would one of the greatest poets in history resort to this sort of repetition? So I asked Gabriel Wasserman (my go-to researcher of poetry) to help me figure out what’s going on. Gabriel’s immediate reaction was that the Karaite version seemed to preserve a better reading at least with respect to these duplicated three words. But to learn more, he flipped through the Friedberg Geniza Project to show me the fragments of She’areikha that are available online. (1) When I knock on Your gates, O God (Yah), open [them]; and on the day when I am overwhelmed like a petitioner, send forth Your hand [to help me]. (2) May my prayer and my supplication reach You; in place of a sheep and an ‘issaron-measure, take it. (3) Accept the light of my eyes, and guard my tongue; and if I err [=sin] before You – forgive [me]. (4) I lift up my eyes and heart to You; give ear, and keep [Your] eye open. (5) See that my spirit has become humbled inside me; and my soul has become very poor and downcast. In this instance, the Karaite transmission actually appears to preserve a more historical reading than the various versions that I have found in rabbinic circles today. In other instances, the NLI transmission appears to preserve a more historical reading. For those that are super interested in poetry, I provide more analysis of the fragments at the end of the article. But at some point I guess it doesn’t matter whether something is “original” or not. These songs take on a life and meaning of their own. I encourage you to find your favorite version and sing it with all your heart. After all this research, I have decided that I *will* put She’areikha – the Karaite rendition – in the beginning of the erev Shabbat prayerbook. Somehow doing this work – even to learn that in some cases the Karaite transmission is markedly different from the Geniza fragments – brought me closer to the poem. 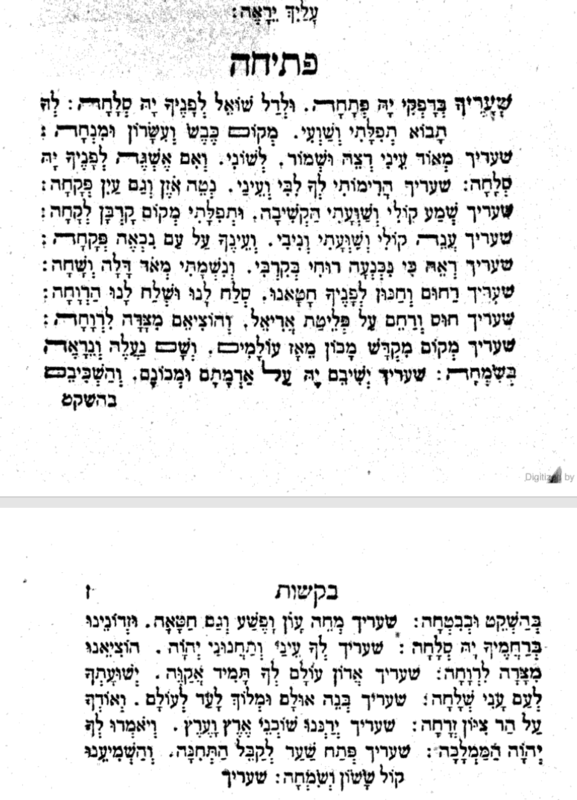 A final anecdote: as noted, the Karaite rendition also includes some additional pesukim from the Tanakh, which are thematically related to She’areikha and to each other. I had the honor of singing the Karaite rendition (just the four lines) to Peninsula Sinai Congregation in Foster City, CA on the last day that Peninsula Sinai hosted the KJA while our synagogue was under renovation. The reason I chose this song was precisely because it was of Rabbanite origin. I also chose the song because the first line that the Karaites sing after the first four lines of She’areikha is Jacob the Patriarch’s famous line from Genesis 28: And he was afraid and he said, ‘how awesome is this place’ for this is none other than the house of God, and this is the gate of heaven. I then thanked the Peninsula Sinai for opening their doors and their gates to us, and told them that their place is indeed awesome, and that when we open the doors of our religious institutions, it is as if we are opening the gates of heaven. As promised for those interested in poetry, here are some more details. 1. How Many Lines is the She’areikha? As you can see above, both the NLI version and the Karaite transmission have four lines. This makes sense since the acrostic for the four-line poem is the authors name: Shelomo, Solomon. 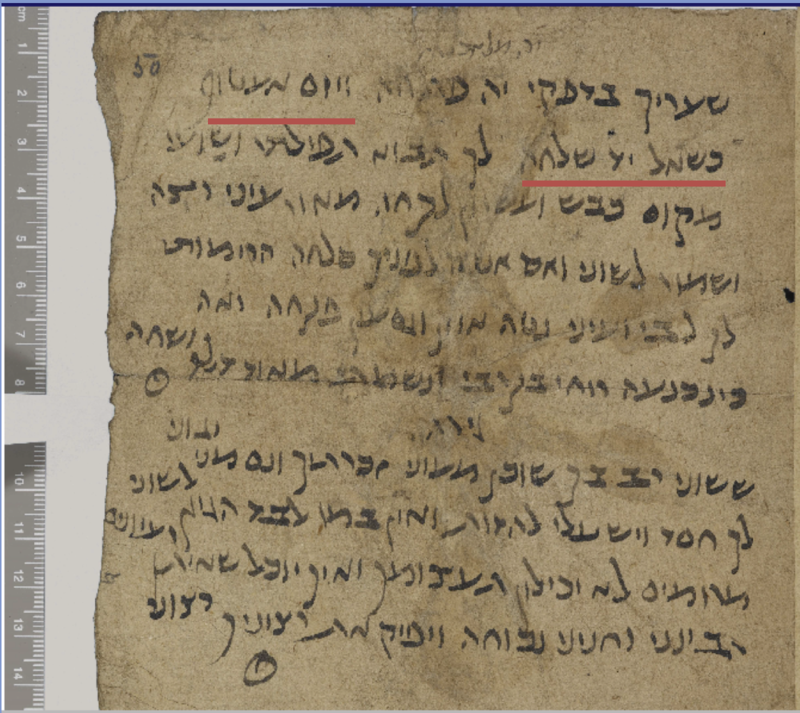 But the version from the Friedberg Geniza Project that I posted above has five lines. Of course, Davidson did not have access to these Geniza fragments, and just because this one rendition of the poem had five lines, does not mean that the original had five lines. But it turns out that *every* version of she’areikha for which a Geniza fragment is online has a fifth line that is very consistent across all samples. That does not mean the original had a fifth line– but it does lend some historicity to the fifth line. Both the Karaite transmission and the NLI version have four lines that rhyme the final syllable: ḥa (ḥet-qamatz-hé). So the rhyme is vowel-consonant-vowel (qamatz-ḥet-qamatz). Also not there is some interesting symmetry in the rhyme Shelaḥa (end of line 1) rhymes with selaḥaḥ (end of line three) in that the only difference is the first letter. This forms vowel-consonant-vowel-consonant (sheva-lamed-qamatz-ḥet-qamatz). Something similar happens at the end of the lines 2 and 4 – where the the only difference is the first letter, forming a rhyme with vowel-consonant-vowel-consonant (sheva-kof-qamatz-ḥet-qamatz). Assonance: The last word of every line, including the last line, has the following pattern consonant-sheva-consonant-qamatz-consonant-qamatz, forming assonance in these final words. As mentioned, the Karaite transmission has some interesting, additional pesukim not found in any Rabbanite sources I have encountered. She’areikha and subsequent verses in the Karaite siddur. When I knock on Your gates, O Yah, open them; and if I am overwhelmed like a petitioner, send forth Your hand [to help me]. May my prayer reach You, in my supplication, in place of a sheep and an ‘issaron-measure for a grain-offering. Accept the light of my eyes, and guard my heart; give ear, and keep [Your] eye open. I lift up my eyes and heart to You; and if I err before You – forgive [me]. 4. My Soul or My Fat? In addition to the fragments that Gabriel found in the Geniza (see the rest below), he also tracked down a literary analysis by Idit Einat-Nov in her book הרשויות האישיות: עיון ספרותי בשירי הסוגה וביחסם אל שירי קודש אחרים (Personal Reshuyot: A Literary Analysis of the Genre and its Relation to Other Sacred Poetry), Bar-Ilan University Press, 2012. She does not deal with textual variants, but merely prints the text as it appears in another publication. This other publication has the same text set forth in the first fragment I showed above, except for the second half of the last line, where he prints ומשמני מאד רזה ושחה, “and my fatness has become very thin and downcast”, rather than ונשמתי מאד דלה ושחה, “and my soul has become very poor and downcast”. Below you can download and review the other items that Gabriel provided me – with some initial comments by Gabriel. 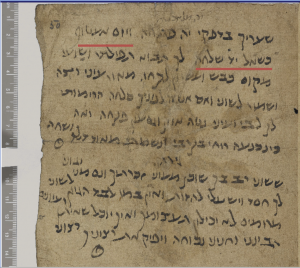 For now, I will note that although my preference is for the reading of “lekaḥa”- as opposed to some version of “minḥa”, the minḥa reading is not unprecedented in the Geniza documents. Thank you, Shawn, for this very interesting article and for posting the song! But, would you have a transliteration to help the non-hebrew speakers to sing?